Thanks. It's great to be here. I'm particularly pleased to be here talking about the future of the Industrial Internet of Things, or IoT. My agency, the National Institute of Standards and Technology (NIST), works with industry to develop the measurements, technology and standards needed to spur innovation. NIST is part of the Department of Commerce, and for more than 100 years, we have worked closely with industry to facilitate innovation and promote commerce and free and fair trade. And if ever there was a technology appropriate for strong collaborations among industry and government, it's IoT. And I want to convey the greetings of Commerce Secretary Penny Pritzker, who sees IOT as an area of tremendous opportunity for U.S. companies and for economic growth. IoT is a core element of the department's Digital Economy agenda. We have agencies within the department who are addressing IoT issues from technologies to standards to spectrum use/sharing to international trade to patents. We have two additional representatives speaking about issues important to the department. Later today, Chris Greer from NIST will be giving a lecture on cyber-physical systems and the factory of the future. And Kelly Welsh, the department's General Counsel, will be giving the keynote tomorrow on the economics of the industrial Internet. IoT technologies are creating a new paradigm in industry and at the same time reaching into every corner of our daily lives. By 2020, analysts predict that tens of billions of interconnected devices will do everything from juggling a family's home energy usage to synchronizing industrial operations for global companies. For some companies, that future is already here. Detailed, real-time information from the factory floor is being interconnected in powerful ways to reduce waste, expand product options and optimize operations. The McKinsey Institute estimates that IoT broadly has a total potential economic impact of $4 to $11 trillion a year by 2025. Much of that impact will come from new, innovative products and services that may literally transform our economy. But to realize this potential, there is still a lot of work to be done. 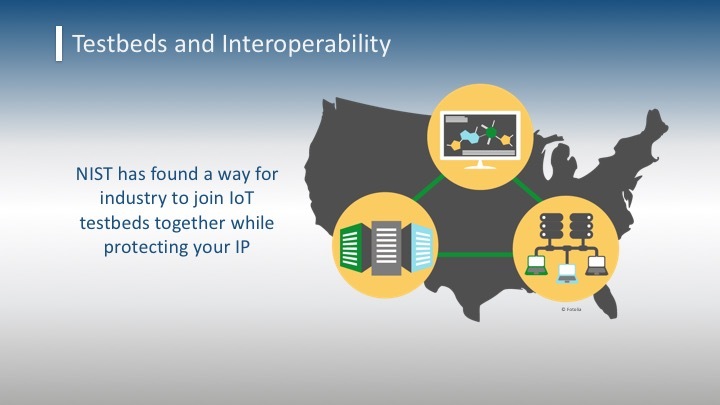 How do we ensure that IoT technologies are truly interoperable and deliver accurate data? How do we massively increase connectivity while still protecting security and privacy? That's where NIST comes in. Our vision is to be "industry's national lab." We have about 3,400 scientists, engineers and administrative support professionals whose primary mission is to help American industry remain competitive. We do this, in part, by continually scanning the horizon for the "next big thing" and adjusting our programs to meet our national and societal needs. One of the most important things that any new industrial technology must have to be widely adopted is trust. Trust among users that the technology will provide them benefit and not cause the harm. Trust that the technology will work as advertised. NIST is leading the way toward a trusted IoT infrastructure through both lab-based physics, engineering and cybersecurity research. Pervasive wireless communications by many different types of IoT devices across many different platforms presents particularly daunting cybersecurity and privacy challenges. NIST has a cybersecurity research portfolio that covers everything from cryptography to mobile and Bluetooth communications. Through these programs, we share results and best practices that play a key role in U.S. cybersecurity standards development. We also have a National Cybersecurity Center of Excellence that addresses businesses' most pressing cybersecurity problems with practical, standards-based solutions using commercially available and open source technologies. With 22 committed industry partners from leading cybersecurity companies, the NCCoE is key resource for meeting IoT and other industrial cybersecurity needs. On the laboratory front, we're inventing temperature, motion, visual and other sensors that are smaller, better, cheaper. We are backing them up with unbiased, interoperable standards so that they can reliably "talk" to each other. We're using our decades of research on the performance of robots to improve standards and systems integration that helps ensure factory workers can work safely nearby. A research testbed is a place you can take your prototype product and see how well it functions. And we've created testbeds in our laboratories that allow us to conduct research, which is paving the way for interoperability, safety, security and automation across different sectors. For IoT purposes, there are many dozens of these testbeds across the country—some at big universities like Vanderbilt. But these testbeds are generally sector specific. We want to overcome that. We are already seeing a world in which large systems need to be tested with respect to other systems—and that's too big for a single testbed to handle. Eventually, we will need to use many of them together. So NIST has reviewed 79 testbeds around the world and analyzed what they're doing that's working—and what's missing. Our engineers came up with a way of conducting experiments on the large scale the IoT demands by joining many testbeds together. It allows us to link real physical systems with virtual models—through a federated testbed system. Anyone who wants to do testing via the federated testbed system will be able to do it without revealing any proprietary technology. This will allow competitors to work together in the same space to test their component's functionality without revealing anything under the hood. Large-scale industrial IoT is still in its early stages. But, no doubt, you're here because of the buzz you've heard that it's already working for some companies. For example, companies whose automation efforts include sensing and actuator technology are solving problems that improve their efficiency, their business models and their agility in the marketplace. We're seeing this in every sector. Maybe you're a vehicle company like Harley Davidson. According to information from supplier SAP, the Harley factory used to take 21 days to turn around one of their specialty bikes. Recently, this iconic American company upgraded its plant to use IoT-based technology. As a result, Harley can now build 1,700 variations on a single assembly line. Now it takes as little as six hours to build a Harley just for you. Or maybe you're a beverage maker like Oregon's Full Sail Brewery. Full Sail added a system that allows them to pull more data from their manufacturing processes and optimize their operations. Their brewing capacity has increased by 25 percent, the time of each brew cycle has been cut by almost half, and they estimate it will decrease their annual water usage by one million gallons. Examples of "industrial Internets" such as these are great encouragement. It helps everyone to see clearly that technology, applied well, can help a business grow. One hundred years after the industrial revolution, we've come full circle. Individual craftsmanship was once replaced by assembly lines to make one product efficiently. 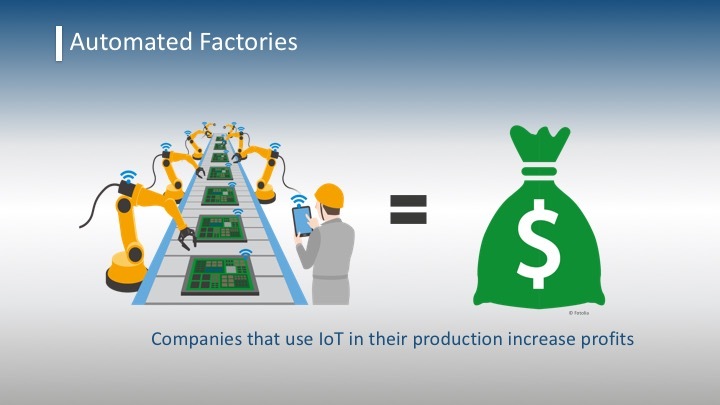 Now IoT technologies help manufacture an incredible array of individually crafted products—but more safely and more efficiently. We at NIST hope to help our industry take better advantage of that new paradigm by providing some context that may help you plan your investments and business upgrades. IoT is a fast-moving technology. There's some chaos in the marketplace. Hence, there's risk. At NIST, we work to lower the risk of adopting promising technologies like IoT by bringing some order to that chaos. We're an agency of measurement scientists, so we start by measuring the chaos. (brag!!!) But to affect the right change, measure the right things, we must talk to you, the stakeholders in this technology who have skin in the game. One of the mechanisms we use to do that is the "public working group." As the name implies, a public working group is a way for stakeholders like yourselves to gather and hash out solutions to industry-wide problems before they occur. Problems that in the past, have cropped up due to a particular company dominating a field, for example, or by "stovepiping" within separate sectors of the economy. We have many of these groups working on IoT-related subjects such as Big Data, Cloud Computing, Smart Grid and Cyber-Physical Systems (which is a more general term we use at NIST to refer to IoT research). Thousands of industry and academic experts participate. They work within subgroups. And each subgroup is led by prominent members of industry and academia, along with a NIST co-lead. In part, what these public working groups create are framework documents. They are living documents that change as the groups address their members' concerns and are updated regularly. They describe the current state of the art and lay out a roadmap for the future. So far, NIST's Public Working Groups have released frameworks about cyber-physical Systems, about smart grid, about cybersecurity, and many other issues that matter to anyone invested in IoT. How do these frameworks help you? For one thing, they help define a common language. We need to be able to communicate with shared technical definitions across all domains—a prerequisite for interoperability. How can a system's interconnected pieces send useful timing signals to one another? How can data sent from one device be comprehensible to another—regardless of their design? How do we ensure the network they form is trustworthy? And once all these machines are communicating with each other, how can we ensure they will interact easily with people? Here, the Public Working Group is analyzing the risks so that we can trust that the IoT will deliver its planned value. If you are interested in discussions like these, our public working groups are open to all. 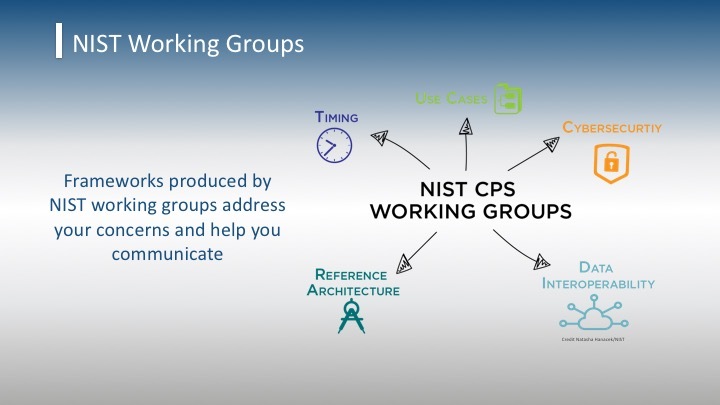 I invite you to find the CPS Public Working Group on NIST's website so you can join us. So through public collaboration, NIST's working groups are producing framework documents—roadmaps to help make sure you are considering the key aspects of the IoT when you plan your next big move. And fundamentally, all of these efforts are about creating an efficient marketplace for IoT solutions. Just as framework documents, standards and working groups help create order from chaos, creating new marketplaces is about bringing many ideas and perspectives together to create the art of the possible. And that is the vision behind the third lever in the NIST IoT tool box—Challenges. 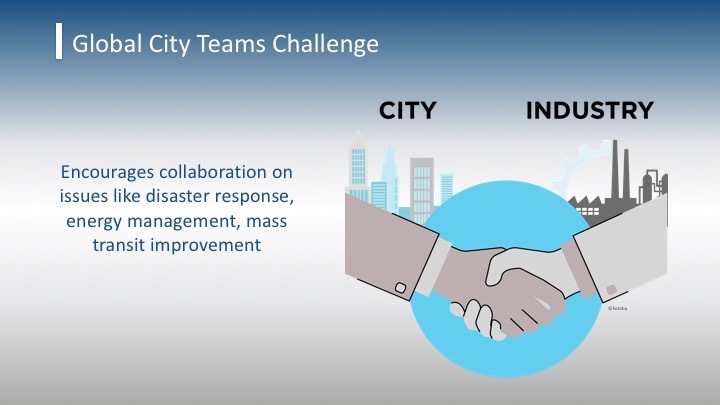 For example, NIST and several partners launched the Global City Teams Challenge to bring together two key groups—communities facing problems and innovators with the IoT-based solutions. The program encourages collaboration on issues ranging from disaster response to energy management to mass transit improvement. The Challenge's first round began in September 2014. It brought together 64 teams from more than 50 cities and 230 organizations. The teams demonstrated tangible benefits of using IoT, showing solutions that could be deployed across multiple cities. One example is New York City's Link NYC, which is replacing many old-school phone booths with WiFi hotspots. These will not only provide Internet access for residents, but will also generate revenue from ads. They also have an array of sensors that will help track environmental quality in the city. Another example comes from AT&T and IBM, which are working on water management systems that can pinpoint leaks in water pipes. It was initially conceived in Las Vegas and worked well enough that it's being replicated in L.A. and Atlanta. In both of these cases, you have a platform-based case where a solution proves successful enough in one place to be perceived as a best practice and gets adopted in other cities. But this sort of wider adoption can work not only across cities, but also across industry sectors. More than 1,400 people attended the first round's final expo last June, including the King and Queen of the Netherlands. The second round of the Challenge has begun, and we will showcase the results at an expo planned for June 2017. It's not too late for your great idea to be part of it. Contact us, and we will help hook your project up with a community that might be able to use it. 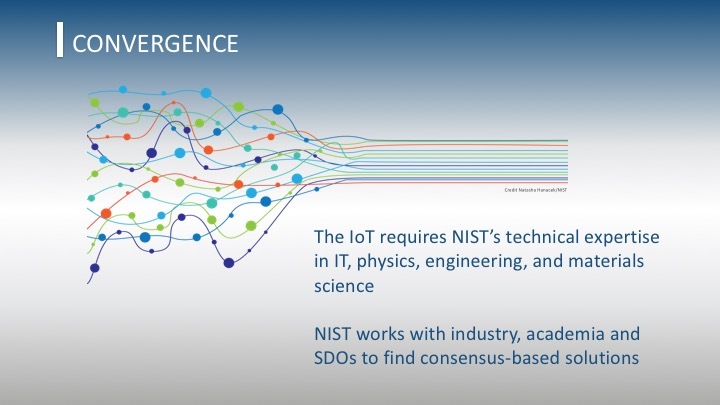 NIST's overall goal is to create forces for convergence. We work with industry, academia and standards-development organizations and others to find consensus-based solutions. We help create a common technical foundation—that's the CPS Framework and other related documents. We help organizations who each have a piece of the puzzle create partnerships that produce real economic results—that's Global Cities. 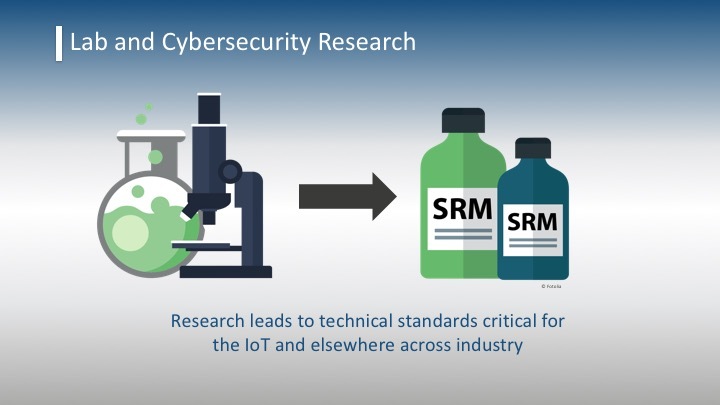 And we help organize a powerful research infrastructure beyond NIST that will help the industry build and use devices that will have seamless interoperability—that's the CPS test bed. These are complex technical issues that require a comprehensive approach, not just in the world of IT, but also physics, engineering and materials science. 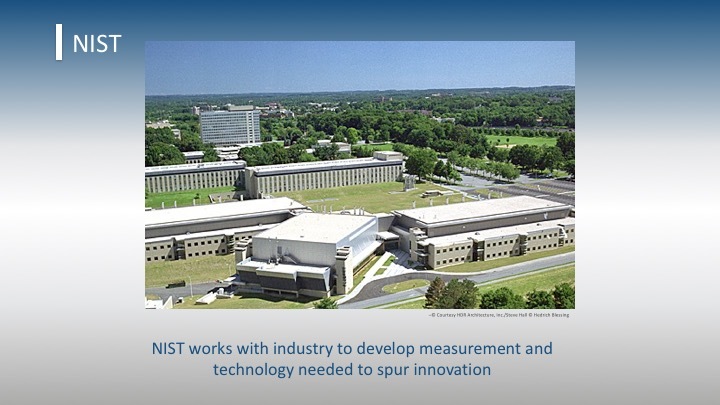 As measurement experts, NIST has an incredibly diverse range of technical expertise. But it's our expertise in collaboration that is perhaps most important. We are in a very exciting time right now. IoT can potentially change the way we live and improve our quality of life. It can make our factories safer and more efficient and our products more innovative. It can help our companies compete better in world markets and maybe it can even help improve your company's bottom line. But we can't help ensure this future without your help. One of our sister agencies within the Department of Commerce, the National Telecommunications and Information Administration, plans to engage with the broader community. They'll be asking the public to identify key issues related to IoT that would benefit from multi-stakeholder discussions. Please consider contributing your ideas to this forum. I also urge you to consider joining NIST's working groups and to get your projects involved in the Global City Teams Challenge. Let's make sure IoT lives up to its tremendous potential. And while we're at it, let's accelerate innovation, create new jobs, and help your companies grow their business.